Supervisor Sandra Lee Fewer speaks at press conference addressing immigration and Trump outside City Hall. Photo by Lola M. Chavez January, 2017. Immigration nonprofits have sprung into action to respond to President Donald Trump’s threats to increase deportations, and are now offering a 24-hour hotline in English, Spanish, Arabic, and Chinese. Anyone who sees Immigration and Customs Enforcement (ICE) activity in San Francisco can call (415) 200-1548 at any time. A call to the hotline initiates a process that includes nonprofits sending their own staff to the scene of the report to verify what happened, remind people of their rights, and if necessary, provide legal support. The line is being run by the San Francisco Immigrant Legal & Education Network, known as SFILEN, which consists of 13 supporting organizations. These include CARECEN, PODER, La Raza Centro Legal, La Raza Centro de Recursos, Causa Justa::Just Cause and Dolores Street Community Services. They comprise the Rapid Response Network, a group of advocates ready to assist in immigration emergencies. The hotline is meant for encounters with ICE only, not for general advice about immigration proceedings. It is limited to San Francisco County, cautioned Marisela Esparza of SFILEN. Since launching on Feb. 10, the line has received more than 450 calls, she said. Many of them were simply people testing to see that the line was live. Others were people calling with the kind of questions that the hotline is not designed to answer such as people needing legal help with non-emergency immigration cases. A handful of the calls the line has fielded in the past few weeks, however, were exactly that scenario, and two people who called the hotline were detained. Members of the Rapid Response Network were able to get one of them released and the other, who had been transferred to Arizona, returned to a local facility. There, the detainee’s family was able to secure legal representation privately. For those who see immigration agents but aren’t their target, Esparza advised recording or photographing their activity and then calling the hotline with that information. Esparza stressed the importance of preventing inaccurate information from circulating about ICE activity. ““We’re just asking folks that unless they personally see ICE agents, that they don’t share it on Facebook or create more panic in the community,” she said. Locally, no major raids have been reported since the election. ICE agents appeared at a daycare and community center on Cesar Chavez Streets in January, but no one was detained. Nonetheless, advocates for immigrants want the community to know they are prepared. 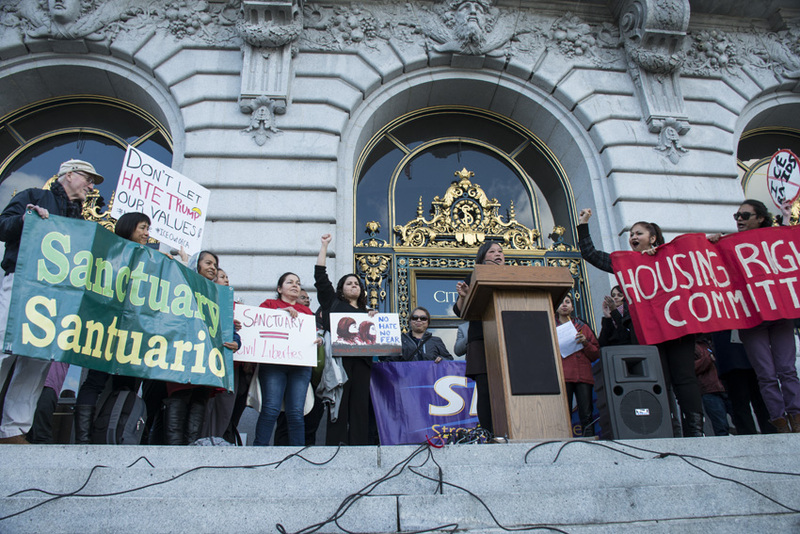 “We want to let everyone here in San Francisco know that we have a system in place ready to respond, that they’re not alone, and that we’re a sanctuary city that cares about our immigrant population,” Esparza said. Supporters who would like to donate to keep the hotline going can do so here. NextDevelopments in Development: Right, Commodity, or Investment?